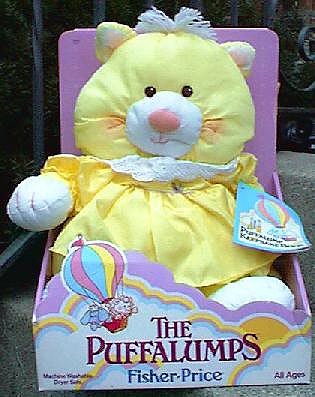 Description: This Puffalump kitten was one of the first six Puffalumps made by Fisher-Price, see #8000 Puffalumps Assortment for a list of the other five first Puffalumps. Kitten was originally introduced in yellow wearing a yellow removable dress. During her short production life, she was available in 3 known colors: yellow, purple, and pink/magenta...each version had a matching colored dress. Only the yellow and purple versions are shown in the dealer catalogues. FPT10174 - Yellow feather light stuffed Puffalump kitten that is made of extra soft parachute-type fabric. She has white yarn sprouts of "hair" on top of her head between her two yellow triangular-shaped ears with white inner ears. She has brown stitched eyes, pink-tinted cheeks with pink stitched whiskers, and a rounded white snout with a pink velvety nose and pink stitched mouth. Kitten has a yellow body and arms and legs with white "paws" on the end. She has a Puffalump trademark symbol on the bottom of her left foot, click here for a photo of the symbol. FPT10155 - Yellow dress with yellow puffy sleeves. The sleeves have elastic around the cuff. She dress has a white scalloped eyelet collar, and a white trim across the chest with an embroidered pink flower in the center. The bottom section of the dress is gathered across the top, but hangs straight down with no trim on the bottom edge of the dress. FPT10175 - Purple feather light stuffed Puffalump kitten that is made of extra soft parachute-type fabric. She has white yarn sprouts of "hair" on top of her head between her two purple triangular-shaped ears. She has brown stitched eyes, cheeks with pink stitched whiskers, and a rounded white snout with a pink velvety nose and pink stitched mouth. Kitten has a purple body and arms and legs with white "paws" on the end. She has a Puffalump trademark symbol on the bottom of her left foot, click here for a photo of the symbol. FPT10176 - Purple dress with purple puffy sleeves. The sleeves have elastic around the cuff. The dress has a white collar with lace trim on the edges and a pink ribbon bow in the center. The dress has a thin pink trim across the chest, and the bottom section of the dress is gathered across the top, but hangs straight down with no trim on the bottom edge of the dress. 1988 catalogue pictures ONLY the purple cat and dress mentioned above. FPT10177 - Pink/magenta feather light stuffed Puffalump kitten that is made of extra soft parachute-type fabric. She has white yarn sprouts of "hair" on top of her head between her two pink triangular-shaped ears with white inner ears. She has brown stitched eyes, pink-tinted cheeks with pink stitched whiskers, and a rounded white snout with a pink velvety nose and pink stitched mouth. Kitten has a pink body and arms and legs with white "paws" on the end. She has a Puffalump trademark symbol on the bottom of her left foot, click here for a photo of the symbol. FPT10153 - Pink short-sleeve dress with a smocked bodice and white lace collar. The sleeves have elastic cuffs with white lace trim on the edges. The white collar has white lace trim on the edges and an embroidered flower in the center. The dress has a smocked bondice (gathered chest area) with white lace trim around the waist. The bottom section of the dress is slightly gathered near the top, but it hangs straigt down with no lace nor trim on the bottom edge. FP8002BOXA1986 - (Box Only) Sold in a 11" long, 14" high, 8-5/16" deep hands-on (non-enclosed) display box with a PINK backdrop panel. Top right corner of backdrop panel is marked, "8000 Asst.". This box has pastel colored clouds and Puffalumps in a hot air balloon on the front. FP8002SETA1986 - (Complete Set - Yellow Kitten in pink box) Complete set in original display box. FP8002BOXB1986 - (Box Only) Sold in a 11" long, 14" high, 8-5/16" deep hands-on (non-enclosed) display box with a ? backdrop panel. Top right corner of backdrop panel is marked, "8000 Asst.". This box has pastel colored clouds and Puffalumps in a hot air balloon on the front. FP8002SETB1986 - (Complete Set - Purple Kitten in ? box) Complete set in original display box. FP8002BOXC1986 - (Box Only) Sold in a 11" long, 14" high, 8-5/16" deep hands-on (non-enclosed) display box with a ? backdrop panel. Top right corner of backdrop panel is marked, "8000 Asst.". This box has pastel colored clouds and Puffalumps in a hot air balloon on the front. FP8002SETC1986 - (Complete Set - Pink/Magenta Kitten in ? box) Complete set in original display box.